Handcrafted Yoga Adventures. Experience Your Vacation Differently. Each day will be a new adventure when you open your eyes quietly in this beautiful romantic coconut palm grove on the Arabian sea. As you will lean softly to a gentle intrigued feeling of total freedom. Our days will be a perfect blend of reverence for the nature surrounding us. Starting with 2 hours of Kundalini Yoga with our master Daljeet Kaur, accompanied by healthy nutritious breakfast. Then we'll have free time to catch some waves rest or inquire Goa. Later along the day will be the afternoon session. The Ayurvedic consultation with Dr. Rohit, or an Ayurvedic massage, or a Yoga session, with Doron Noyman, whatever was set for that day. After we pick you up from the airport in Goa, and as we reach our lovely resort, getting our rooms or cottages, we'll meet for a welcome cocktail. A small introduction party with a D.J.and some vibes, just to get into the vacation atmosphere in ease, inhale the breeze and celebrating our reach to Goa. Every morning for 2 hours will be the Kundalini Yoga session, and 4 afternoons will be a Yoga flow, and introduction to meditation with Doron. It is a perfect opportunity to experience Yoga in a different setting when we all tune to the nature vibes around us, and a bit more quiet and relax. At the afternoons every participate will have an Ayurvedic diagnosis from Dr. Rohit, an Ayurvedic massage, and a lecture together from Dr. Rohit, an introduction to the Ayurvedic system. We'll spend our last evening at one of Goa's finest restaurants and come back to a live music show in Anahata. Daljeet Kaur is a Master of Kundulini Yoga from Berlin Germany. She established and manages her own Yoga center in Kreuzberg Berlin since 2011- Kreuzberg Yoga. She has her own teacher training course which she gives great important to, as she sees the Teaching as her mission and her life´s work. Daljeet path to spirituality began when she was still a child. In that time she had, what she describes as an ''opening experiences'' to the invisible spiritual worlds. Later at the age of 18, she comprehends those experiences better and and begun her spiritual path (Sadhana) with stronger consciousness. She studied many different traditions and spiritual methods and was introduced to Kundalini Yoga in the year 2000 and teaches it since 2006. In addition to the connection to spirituality and yoga, she had formal education in psychology and alternative medicine, and Since 2010 Daljeet teaches meditation courses. She has been studying the Karam Kriya and since then has offered numerological, spiritual life counseling. Daljeet is a spiritual Teacher and personal Consultant. She is also a mother of two children. Her Teachings are always authentic, refreshing and energetic. No worry either if you are an advanced practitioner in yoga or a total beginner, the practice designed for both. Our teachers are very experienced and will give you a close personal attention. Will be other assistance to help you to get deeper and align in the Asanas(postures). 09:00 Some Yogi herbal tea, chai or coffee with some fruit. 11:30-13:30 Buffet breakfast. Including fresh juices, coconut water fresh fruit, salad, porridge or muesli, eggs of your choice, Parathas(the Indian breakfast option changes daily). There are also many Gluten and dairy free options available. 19:30 – Dinner in Anahata's delicious food, or going out to other restaurant in Goa. In Anahata is Indian recipes and integrates, taking them with an original accent into a healthy diet, specially designed for yogis. Their meals are gourmet healthy style, based on locally grown produce, and freshly caught fish and seafood. All meals include gluten-free and vegan options. After the dinner up to the town for some evening activity. We pick a Jam session, live music, electro party, art event, or just a chill-out place... in one of Goa's famous nightlife & culture events. On a quiet and secluded part of Ashvem beach, Goa, nestled amidst coconut palm trees and lush plantations lies Anahata Retreat. Our goal is to transport you to a softer, gentler world at our quietly elegant property that is a private oasis for our guests. 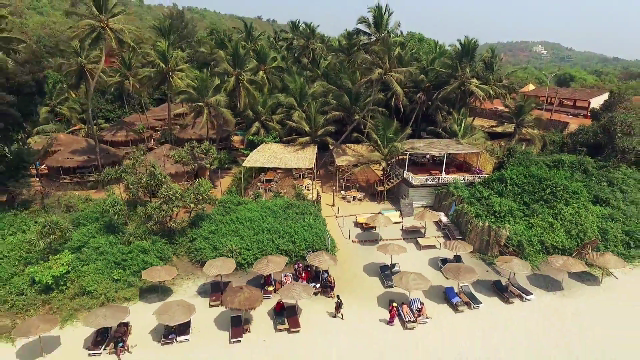 It's a place which lets you truly experience the sheer innocence and beauty of being in nature—within an idyllic palm grove on a virgin beach in North Goa. You’ll feel totally at ease in your ‘home away from home’, with every bedroom having the necessary modern comforts for you to enjoy your stay – from fresh cotton linen, comfortable mattresses and our own custom blended toiletries. The price is per person in shared cottage or a room, on a basis of first book first choice. we will accommodate you with a suitable participant of the same gender. If you would like to be paired up in a room, or any preference you might have, please let us know. single occupancy is also possible with an extra price. Flights. Travel insurance. Visas. Any trips or excursions arranged by you whilst on the retreat. Any other meals or drinks. We are very happy to help with flight searches. Opening night cocktail party. get together chill, and get to know each other. Daily 2 hours Yoga with a yoga Master. Work on yourself, body and mind. 4 Afternoons yoga session. Different kinds of yoga activities, mediation, philosophy or other. depends upon people's request. Enrich yourself. 1 Ayurvedic massage. According to your preference. 1 Ayurvedic nutrition lecture. Enrich your self with valuable knowledge. Breakfast & Food. Pre Yoga herbal tea, coffee and chai. Post Yoga buffet breakfast including fresh juices, coconut water fresh fruit, salad, porridge or muesli, eggs of your choice, Parathas(the Indian breakfast option changes daily) There are also many Gluten and dairy free options available. 8 Dinners. delicious healthy and organic food, serving divers Goan food. home-grown vegetables, fresh organic fruits, leaves and sprouts and more. An evening of live music in our Resort. Transfers. Between Anahata and Dabolism Airport. We will pick you up from the Airport. Different guided tours in Goa. There are many Temples to see, historian trips, or nature reserves to visit. you can visit the elephants or spice farms. Hiking & cycling activities is also possible, in the beautiful setting of Goa. Individual Yoga or Ayurvedic therapy. with the teacher you are with at the workshop, or the Ayurvedic doctor. Boat trips on the Chapora river, or to spot dolphin at the sea. Spa treatments. 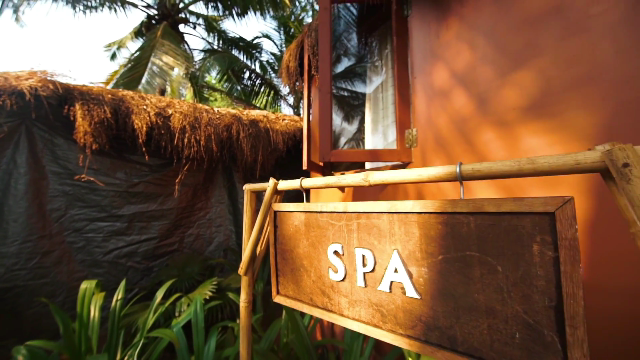 in the resort itself there is very exclusive spa with many kind of treatments, and massages. Very recommended. Cooking classes. a great way to update your cooking knowledge. Sap surf workshops. Learn to surf differently. Music workshops. different instruments, different teachers. Need Any Help? Click Here to get in touch!